Johannesburg - The Inkatha Freedom Party congratulated Natalie du Toit on Saturday, the first South African to win a gold medal at the London Paralympic Games. "Well done Natalie, you keep making South Africa proud," IFP MP and sport spokesperson Mkhuleko Hlengwa said in a statement. "You have never disappointed the nation. You always live up to expectations." 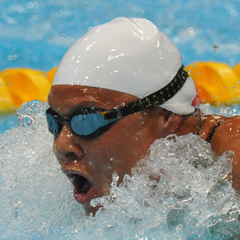 Du Toit won the women's 100m butterfly S9 final on Thursday evening. Having breezed through the heats in the morning, she went on to win the final for the third Games in succession, in 1:09.30. On Friday, Du Toit finished fourth in the 100m backstroke S9 final. She will also compete in the 100m backstroke, the 100m breaststroke later in the week and attempt to defend her medals in the 50m, 100m and 400m freestyle races and the 200m individual medley.